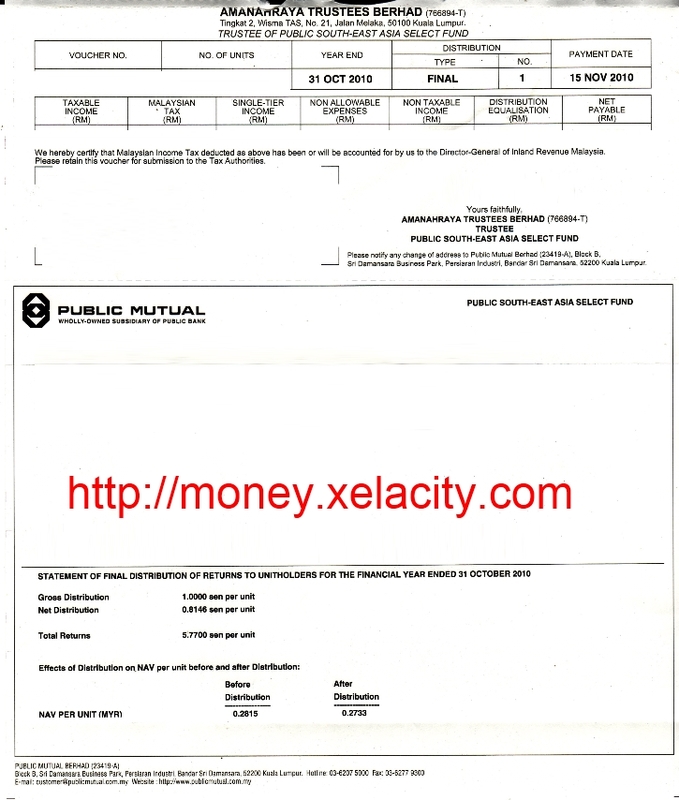 I had received the pay check from Public Mutual for the purpose of Public South-East Asia Select Fund Distribution. This is the very first distribution declaration for PSEASF since it launched on 2 October 2007 . This distribution is for the Final financial year which ended on 31 October 2010, and the payment date was on 15 November 2010. According to The Edge-Lipper Fund Table dated 18 October 2010, PSEASF have generated 21.97% (1-year returns) for the period ended 8 October 2010. The Gross Distribution is at 1.00 Sen per Unit, and the Net Distribution is at 0.8146 Sen per Unit. The Total Returns is at 5.77Sen per Unit. As for the changes in NAV, the PSEASF’s NAV before this distribution was at 0.2815 per unit. However, the NAV had been reduced to 0.2733 per Unit after the declaration of the distribution. © 2011-12 Money.xelacity.com All Rights Reserved. 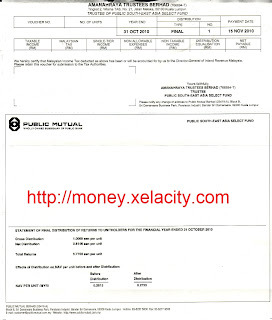 | XELA Money™ 杰赉™理財坊 | XELA City™ 杰赉™大都城 |. Simple theme. Powered by Blogger.